When Alex Henery's game-winning 51-yard field goal cleared the uprights with plenty of room to spare on Thursday night, there wasn't much reaction from the kicker. Holder Chas Henry already had his arms raised to signal a successful kick while the ball was still in the air. Henery's teammates swarmed him on the field. As Henery jogged to the sideline, still showing no emotion, his teammates continued to mob him. Wide receiver DeSean Jackson sprinted down the sideline to slap him on the helmet. "It was pretty cool to get everyone excited like that and get the win," Henery said. "Everyone's happy I guess." Maybe it's Henery's "aw, shucks" attitude that allowed him to thrive on this opportunity. The most accurate kicker in NCAA history was the Eagles' fourth-round draft pick just a year ago. Henery set the NFL rookie record and single-season franchise record for field goal accuracy (88.9 percent). With 118 points, Henery also set the franchise rookie record for scoring. 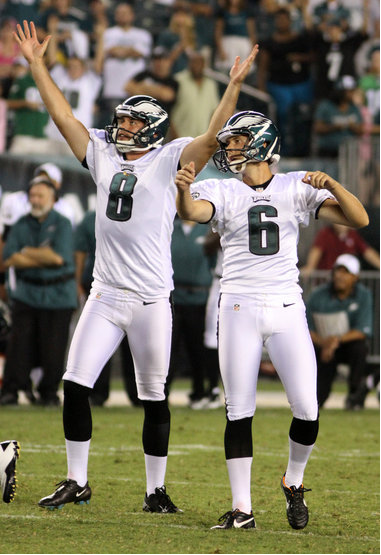 Henery will begin the 2012 regular season with a streak of 16 consecutive successful field goal attempts, which is currently the third-longest in team history. Last season, Henery did hit a 51-yard field goal at Dallas, but he never faced a game-tying or game-winning clutch situation. "It's good to get some of those in before the start of the regular season. I was happy with how I hit it," said Henery, who also had three touchbacks. "I think every kicker looks to get in those situations. It's good to get practice at them and know how to handle situations like that." Henery did not alter the lean of the ball or adjust his kicking style for the distance. Henery said Mother Nature assisted by providing a little wind at his back. In fact, Henery was more than happy to offer compliments to everyone else but himself. He credited the offense for getting him in a position where he could attempt a game-winning kick. Then, he praised long snapper Jon Dorenbos and Henry, who got the ball down where Henery wanted it. "They're perfect like they've always been. I can always rely upon them in situations like that," Henery said. "They came through and I was able to too." The preseason is a time to find out about your football team. The Eagles learned on Thursday night that Henery's strong leg can be trusted in the clutch.